The cabbie who picked me up from the airport couldn’t work out why I would be coming to Canberra for non-work reasons. He perked up, though, as he drove me down Fairburn Avenue and through a big roundabout, pointing to a big domed building up the hill. Don’t worry, I said. I’ll be going there alright. 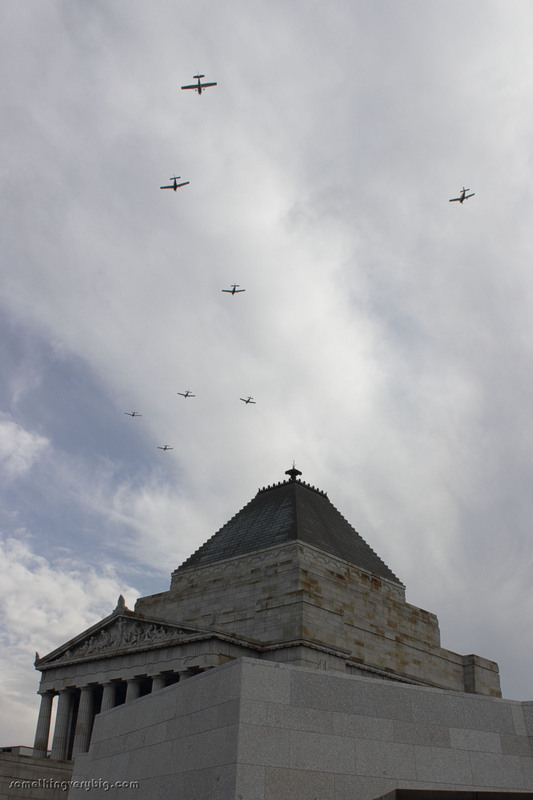 The Australian War Memorial, that big domed building on the hill in front of Mount Ainslie, is the traditional and spiritual home of much of the activity associated with the annual Bomber Command Commemorative Day. The weekend just gone saw the 8th edition take place, under blue skies for once. It began, though, with sad news. 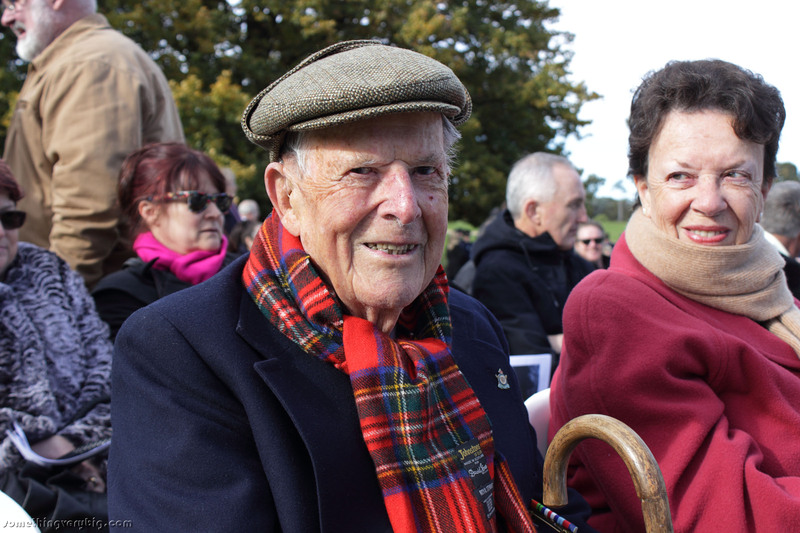 While preparing to leave for the commemorations, Bomber Command Commemorative Day Foundation President Ross Pearson suffered a stroke. As I write it is still too soon to know much but the early signs are, I hear, not good. The knowledge of Ross’ illness cast a dark shadow on the weekend, and he remained in the thoughts of many of those present. 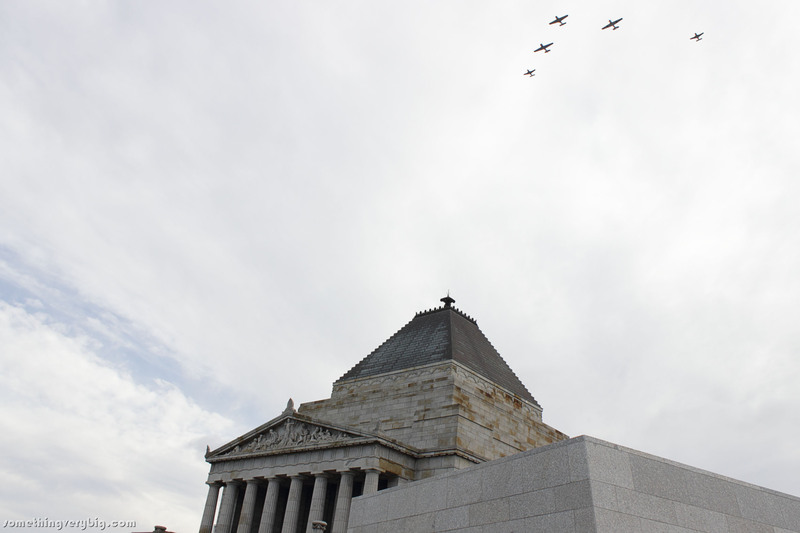 But the show, as they say, must go on, and in the best spirit of Bomber Command, we pressed on regardless. 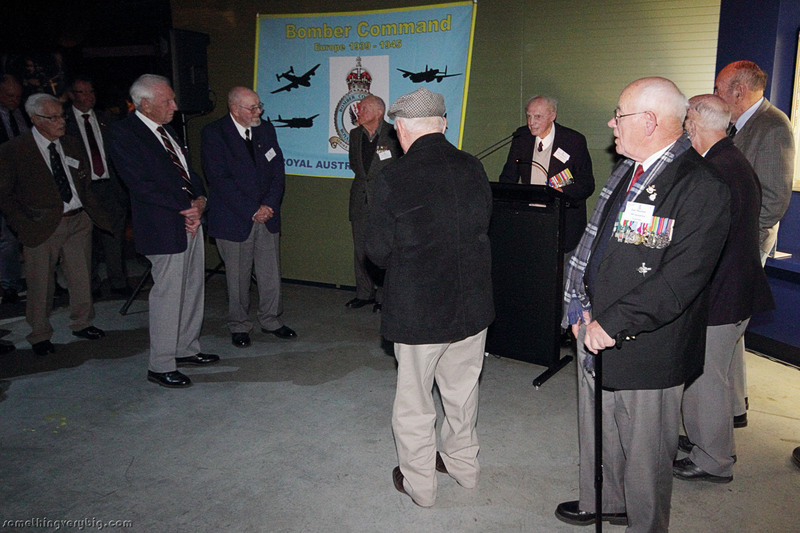 First up was the Meet & Greet function, in the shadow of the great black bomber named G for George. It was one of the bigger crowds in recent memory I thought, and was quite a good evening. 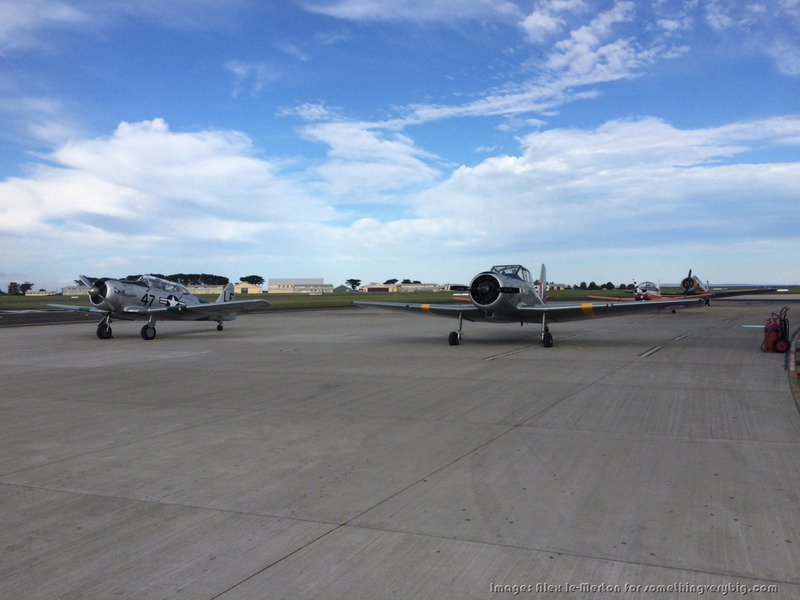 A highlight was seeing two old pilots sitting next to each other having a chat. 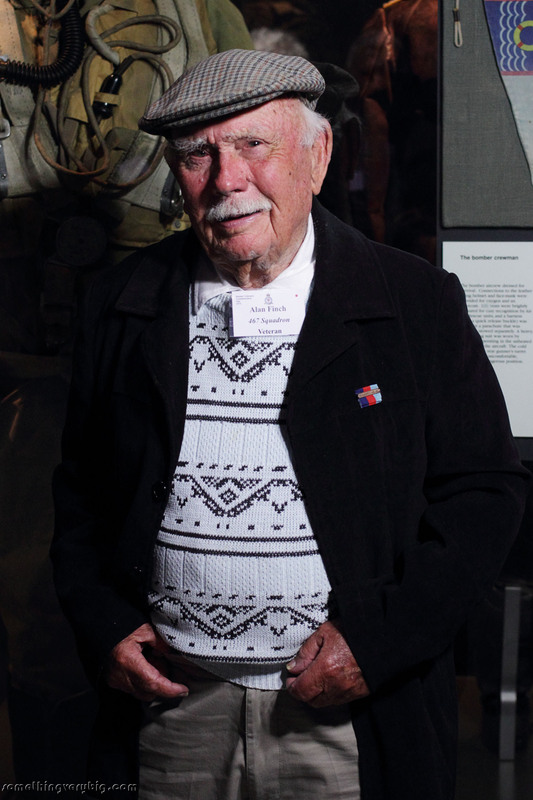 Alan Finch (who I met at this function last year) was posted to 467 Squadron in August 1943 and completed his tour on 19 March 1944. 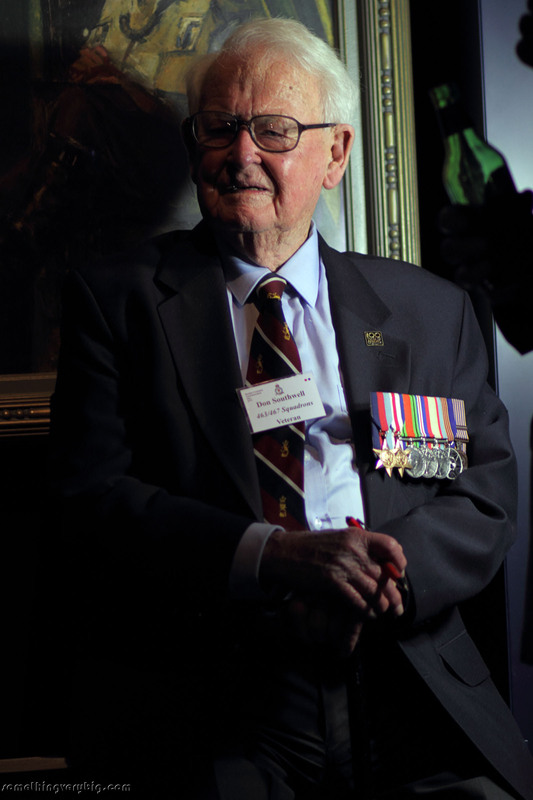 Bill Purdy arrived at 463 Squadron two weeks after Alan left. So while they were not quite both at Waddington at the same time, they were there at the same time as the crew of B for Baker. 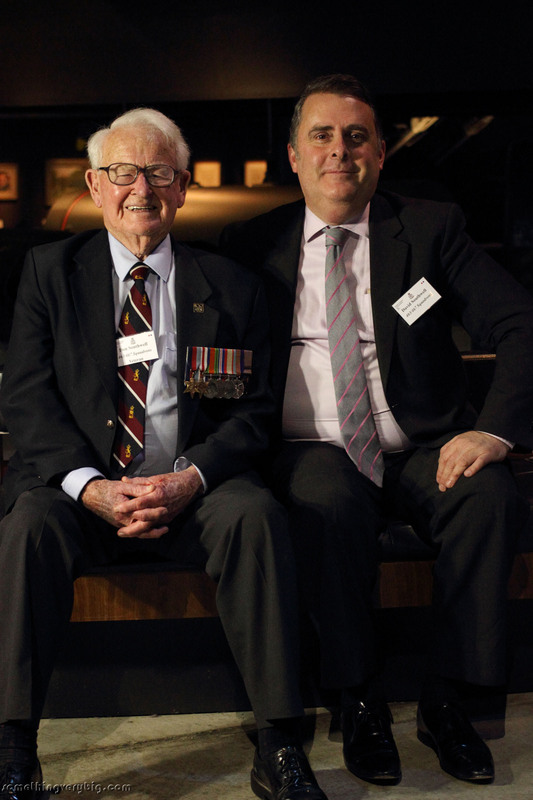 There are not many men around these days who were operating around that time, so to find two of them sitting next to each other was a special moment for me. Once they all got to their operational squadrons, though, it was a different story. The first man was lost on his first trip. The second man lasted three. But the third pilot survived his tour. “Maybe the other two were too good…” Bill mused thoughtfully. It strangely makes sense. Flying perfectly straight and level in a combat zone could be fatal when flak and nightfighters were around. 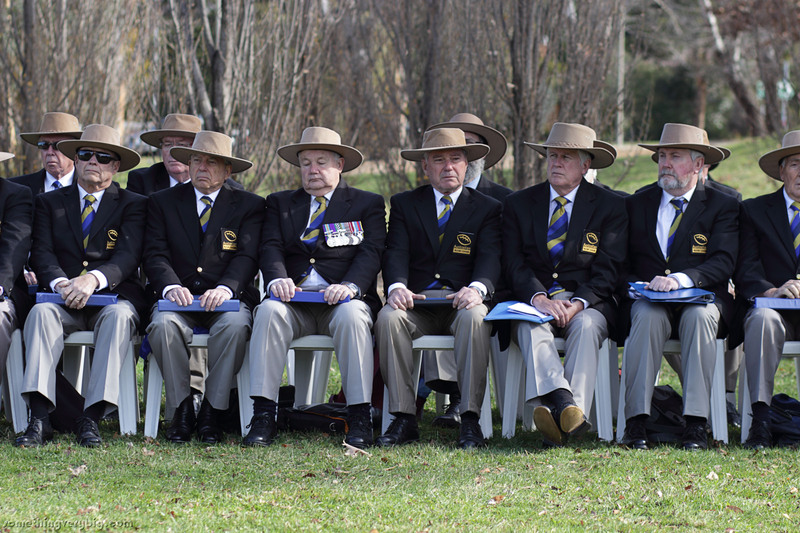 There was an attempt to get a group photo of all the veterans present but it was less than successful. 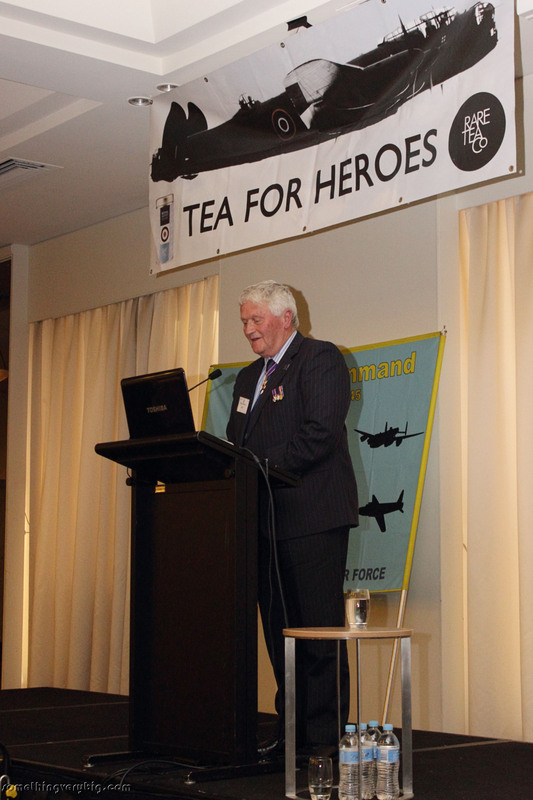 But seeing as everyone was gathered near the lectern at the tail end of George, 467 Squadron mid-upper gunner Albert Wallace took to the microphone to tell a few stories about Australians, WAAFs and sugar tongs. 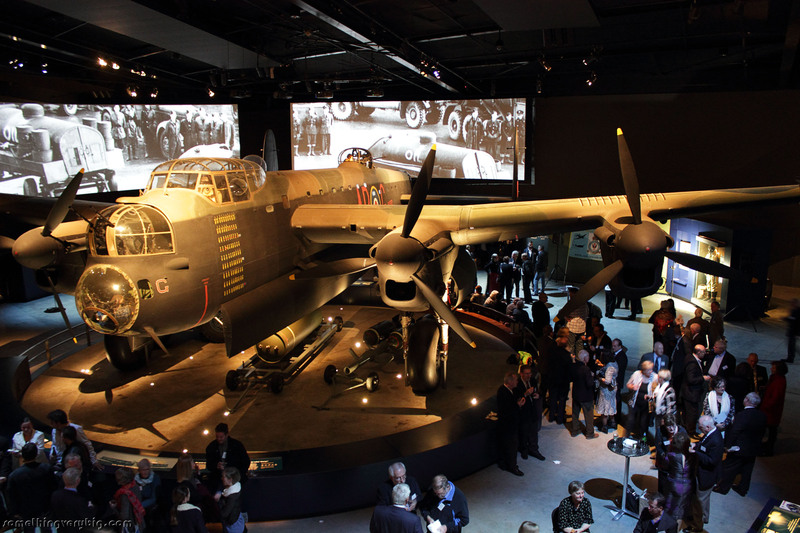 He mentioned being one of the last crews to fly S-Sugar, the Lancaster preserved at the RAF Museum in Hendon. That brought Alan Finch to the front. 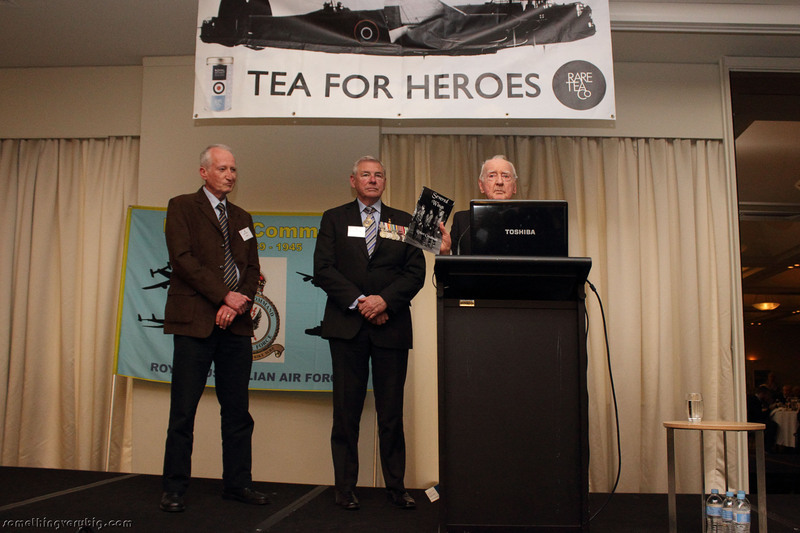 “We were the first crew to fly Sugar on 467 Squadron!” he said. He wasn’t impressed: “I said it wasn’t fit for operational service…” As we now know, of course, Sugar would go on to fly over 100 operations. While all this was going on, I noticed Don Southwell sitting on a convenient ledge in front of a painting of a flight engineer. He had some interesting light falling on his face from a set of lamps that were ostensibly there to illuminate the speaker at the lectern. 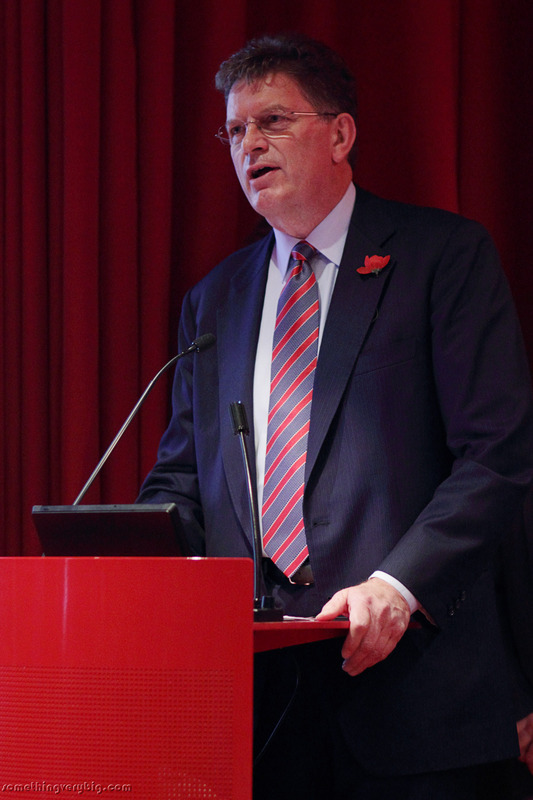 Alan Finch. What a brilliantly relaxed pose!! The ‘official’ hotel for the Bomber Command group had changed to the brand-new Avenue, in the heart of the city. A small group repaired to the hotel bar there following the function for a few drinks. The group was down a little on numbers from previous years, partly because some were still staying at the QT hotel as usual and also because some of the usual suspects were missing (Don Huxtable being a very noticeable absence, being in hospital in Sydney). 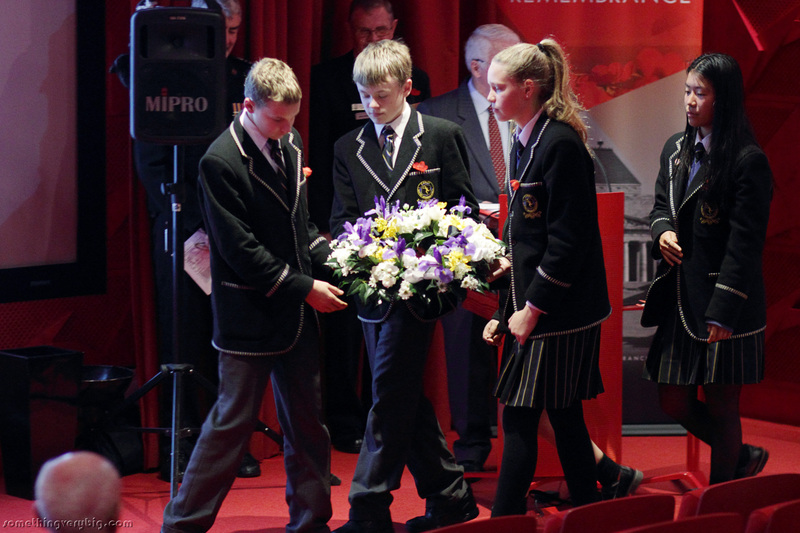 The ghosts of absent friends were very evident. But it was still a very useful and enjoyable evening. At one point I asked Keith Campbell, who had just been served the biggest ‘little’ beer he had ever seen, what he thought of wartime English beer. Not much, as it turns out. “It was weak and tasteless!” he said. 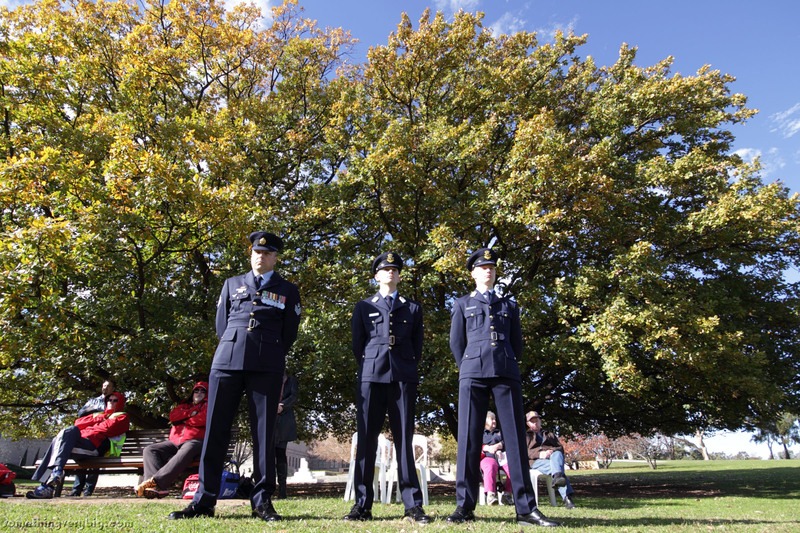 The grass in front of the Bomber Command memorial sculpture in the western grounds of the War Memorial is the original venue for the Bomber Command Commemorative Day, and given it is a dedicated memorial to Bomber Command it makes sense to hold the ceremony in its shadow. But having experienced the heightened atmosphere and mood in the cloisters of the War Memorial for the last two years, I reckon it’s much better up there. And so I was almost hoping for rain when I awoke this morning. But for the first time in three years the ceremony on Sunday morning was held outside under blue skies, and it went rather well. 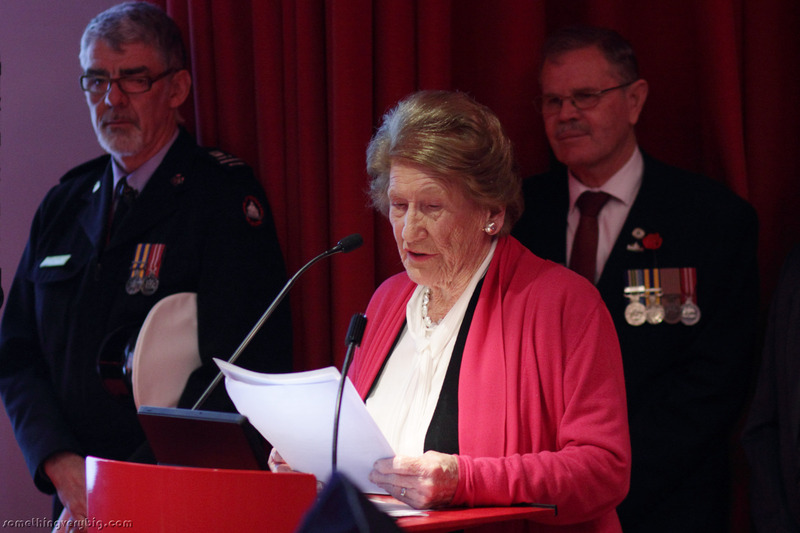 I was most impressed, however, by the speech from Dr Peter Hendy, the Federal Member for Eden-Monaro. It started off the usual way and I was a little worried that it would be a typical politician’s speech, saying the right things but without really knowing or believing in what was being said. But then he veered off into much more personal territory. Dr Hendy, it turned out, had an Uncle Jack, actually a cousin of his father’s, who was a rear gunner in Bomber Command. And so, just like I did, Dr Hendy grew up with stories of “Uncle Jack,” bombers and gun turrets. 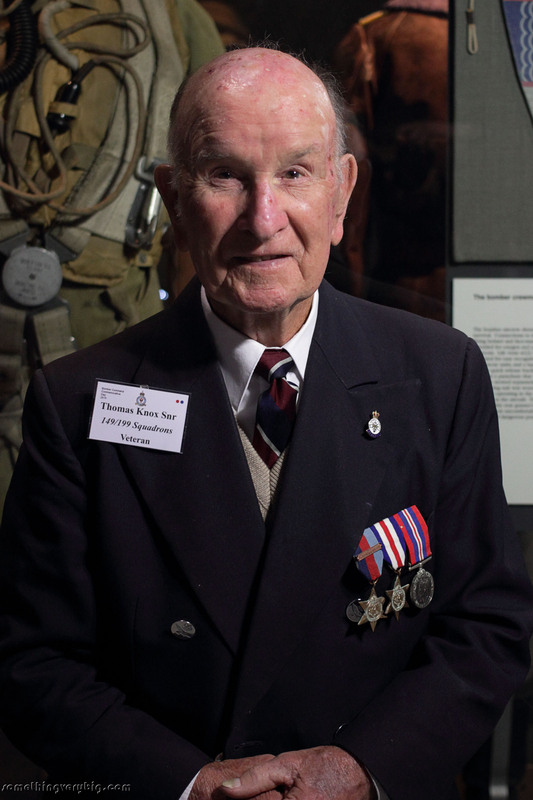 He said that while it’s tempting to speak of Bomber Command airmen as being superhuman, they were actually ordinary people caught up in extraordinary circumstances. 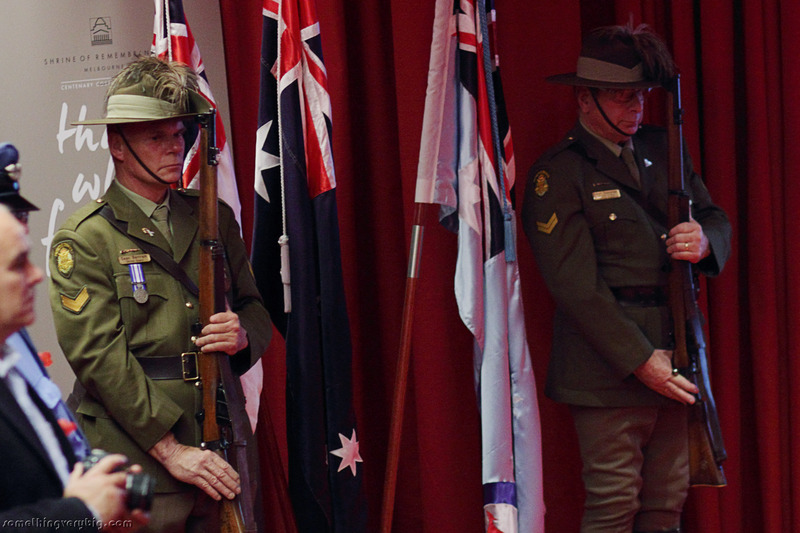 “The extraordinary, ordinary Australians”, he called them, and I thought that a most appropriate description. 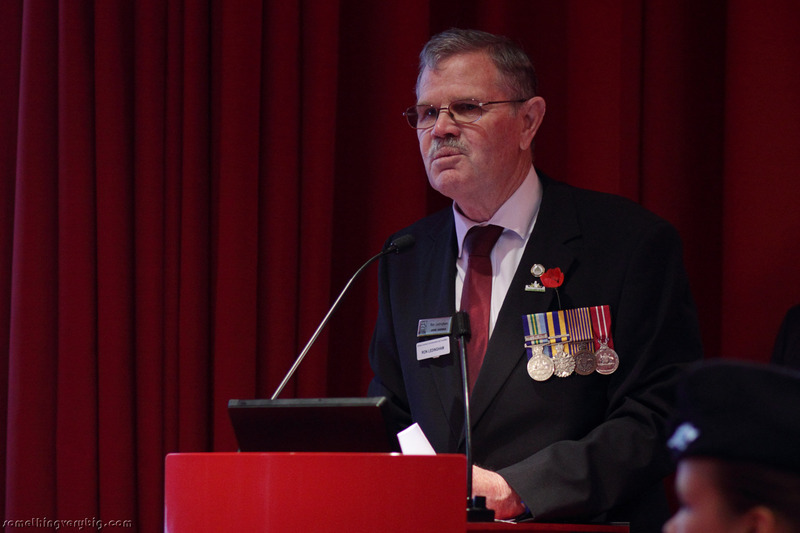 Keith Campbell giving the ‘Reflections’ address. 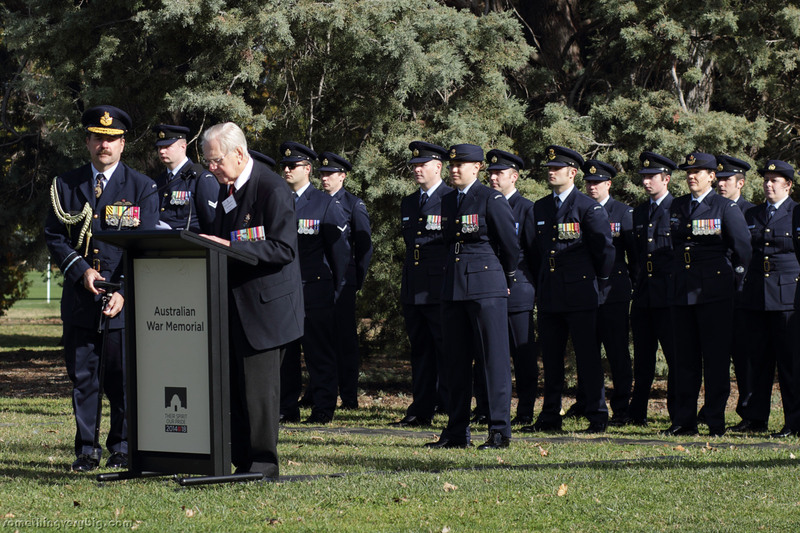 Tom Hopkinson and Don Browning, laying a wreath for 463-467 Squadrons at the Bomber Command memorial. Don’s daughter Jocelyn providing support. 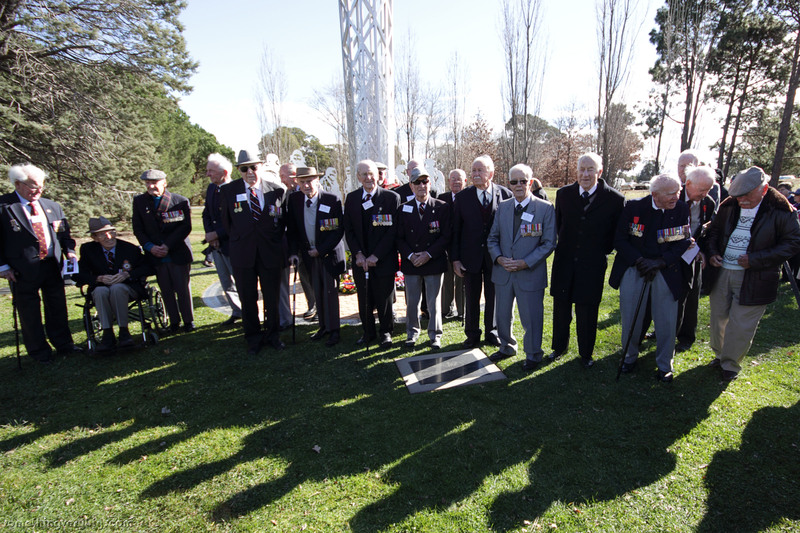 The luncheon was moved from the War Memorial at quite short notice to the QT Hotel because of high demand. More than 180 people were there. There was a lot of brass there. 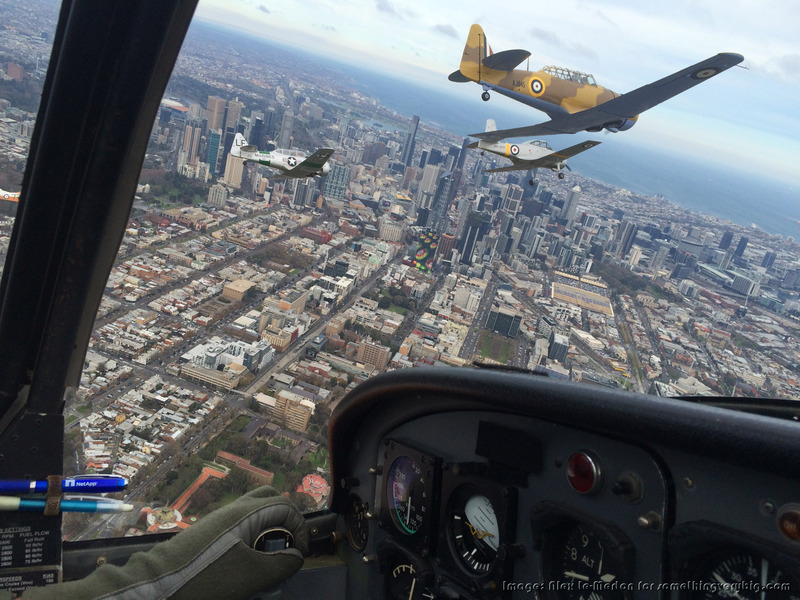 The soon-to-retire Chief of Air Force, Air Marshall Geoff Brown, delivered an intriguing address looking at current capability of the Royal Australian Air Force, including some very rare bombing footage of recent operations in Iraq. Where in Bomber Command’s day 1,000 aircraft might be sent to one target, these days one aircraft might engage four individual targets on a single sortie. He even showed an example of the requirement to avoid collateral damage, when non-combatant vehicles were observed nearing a target and the laser targeting system was used to push the munitions off target after the weapons were released. A capability, one suspects, which Bomber Command would have found quite useful. 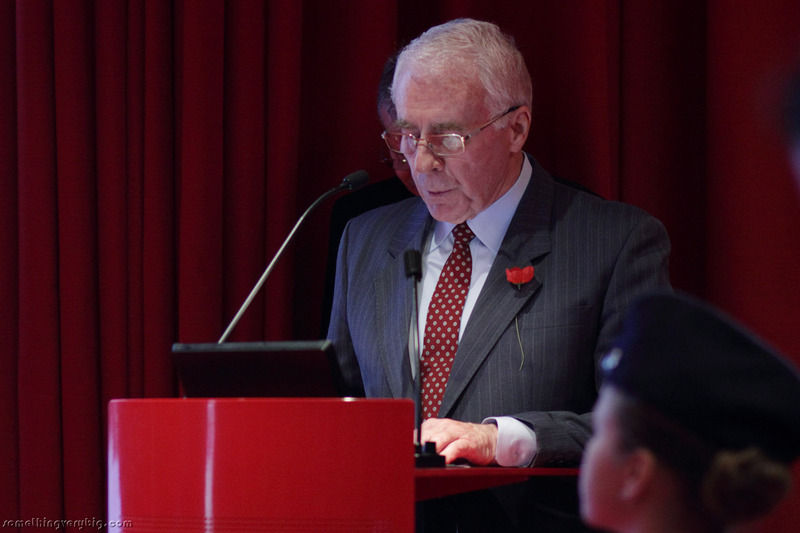 Also speaking was the Chairman of the Trustees of the International Bomber Command Centre, Tony Worth. 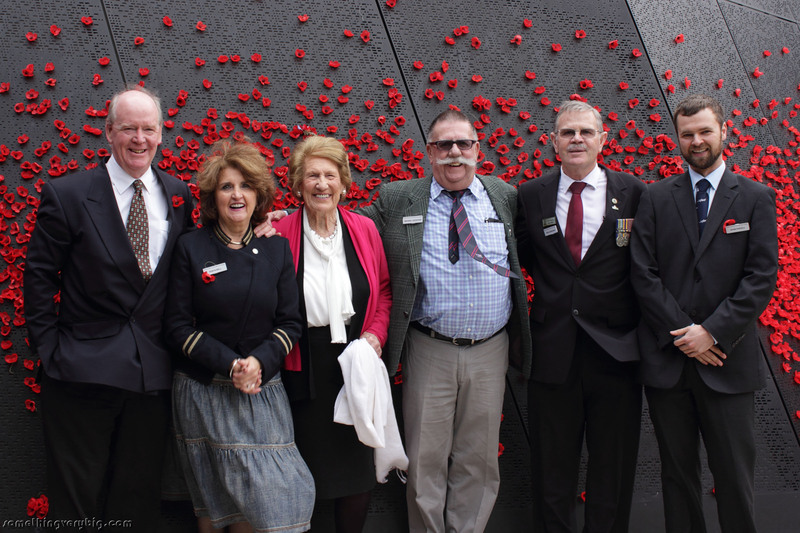 Tony was in Australia as part of a delegation of IBCC people who are working on “an international story of Recognition, Remembrance and Reconciliation”. The Centre, in the early stages of being established on a hillside within sight of Lincoln Cathedral, will consist of a Memorial Spire (which was erected last month), steel walls engraved with the names of those who died in Bomber Command, an education and exhibition centre, ‘Peace Garden’ and, most significantly for me, an ambitious digital archive that aims to become a comprehensive research resource – the ‘go-to’ point for Bomber Command information into the future. 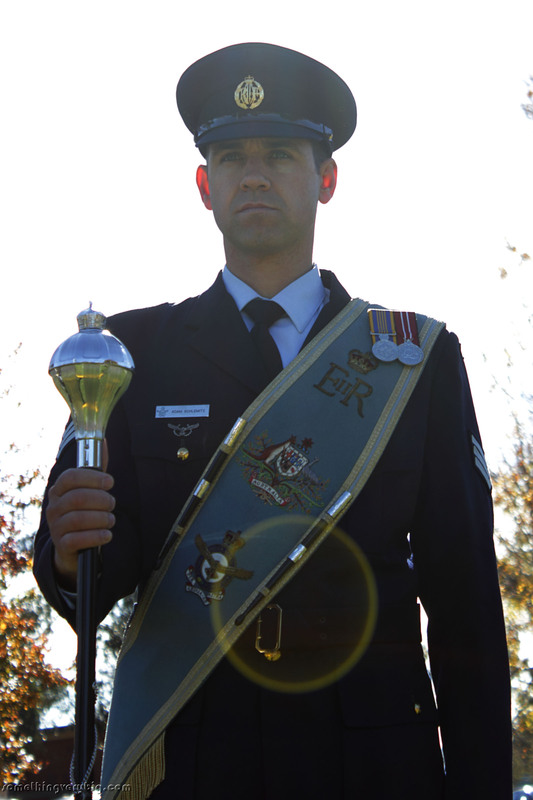 As such they are looking for people worldwide to scan documents and interview veterans and it’s possible that I may become a point of contact for this in Melbourne. It’s a big project with very lofty goals but it certainly looks like they have an enthusiastic team behind it and it will be very interesting to watch their progress. 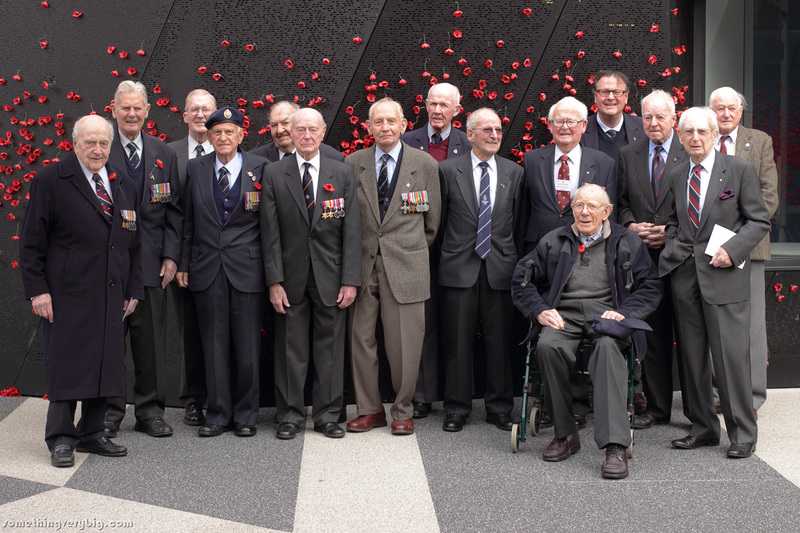 Veterans at the Lunch gathered for a group photo with the two top-ranking members of the current Royal Australian Air Force. 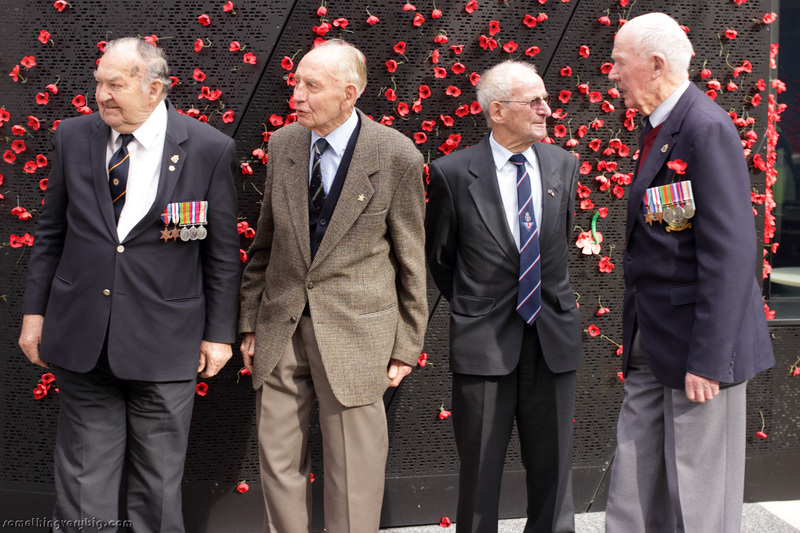 Front row, L-R: Tom Hopkinson, [unknown], Keith Campbell, Max Barry, Rex Austin, Ray Merrill, Jim Clayton. 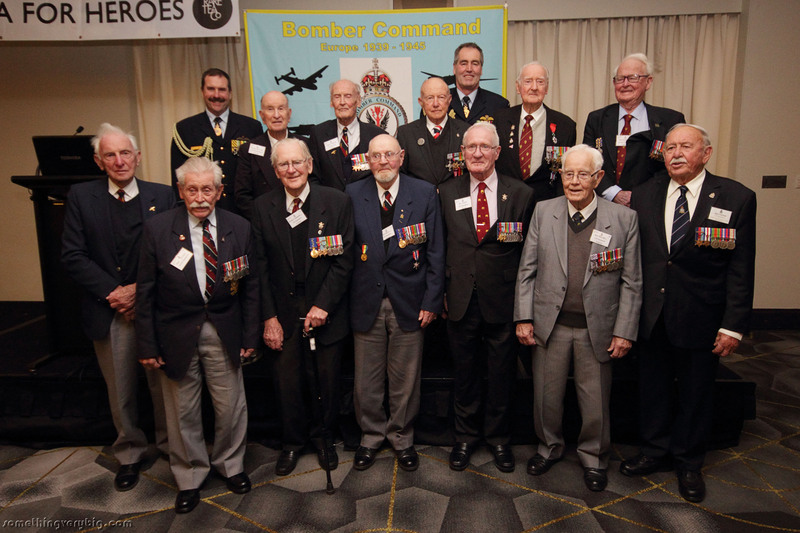 Back row L-R: Deputy Chief of Air Force Air Vice Marshal Gavin ‘Leo’ Davies, Tommy Knox, Angus Cameron, Bill Purdy, Chief of Air Force Air Marshal Geoff Brown, Ron Houghton, Don Southwell. 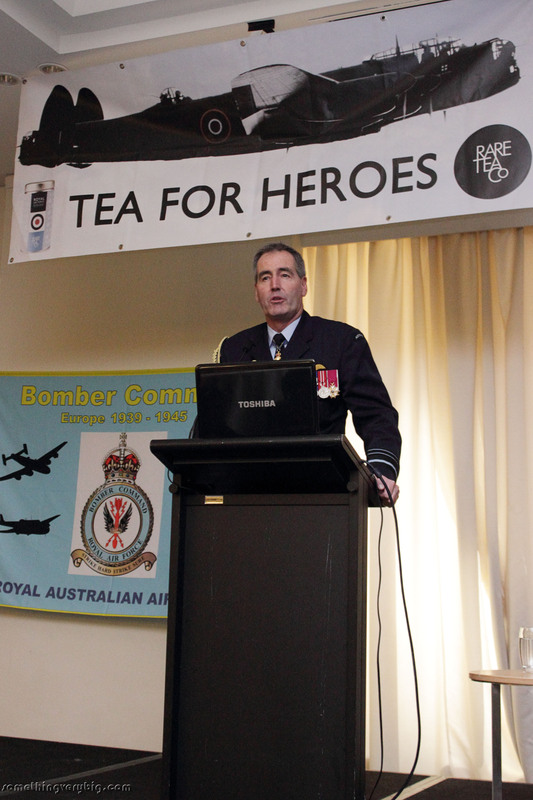 The increased interest in Bomber Command and events of this type can easily be seen in the numbers attending this year. While not the “biggest ever” I think it was a modest increase on last year, even with those notable absentees. While I didn’t come away with as many ‘new’ veterans as I have in the past I still made a lot of contacts and there were many family, friends and hangers-on present. (Including, incredibly enough, one of my high school PE teachers whose wife has a 467 Squadron connection). The news of Ross Pearson’s stroke concentrated some minds on thoughts of what the future might look like for the organisation of this event and others like it, and there was discussion of this important question at various points over the weekend. 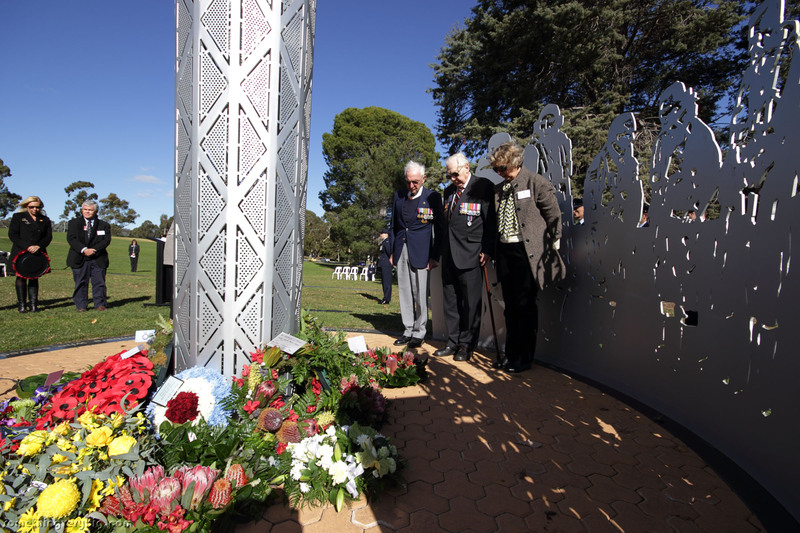 The intention of the group of veterans – led by the late Rollo Kingsford-Smith – who developed the concept for the first Bomber Command Commemorative Day was that it would continue “in perpetuity”, and this intention was restated a couple of times on the weekend. Certainly the numbers present demonstrate that the demand is there and indeed is growing for events of this type. 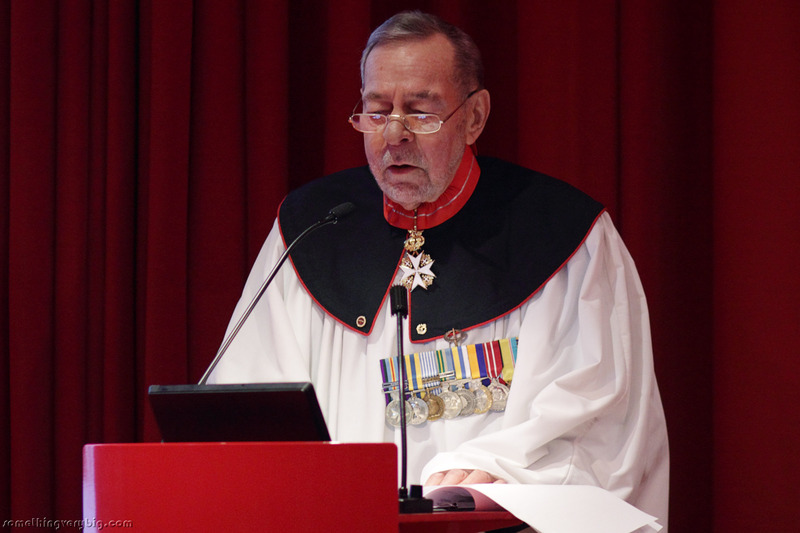 Much of the burden of organising this event already falls on the younger generation, but the inspiration for it is still drawn from the hardy but dwindling band of Bomber Command ‘originals’. Some hard questions will need to be answered when the last of the ‘extraordinary, ordinary Australians’ finally leave this life. 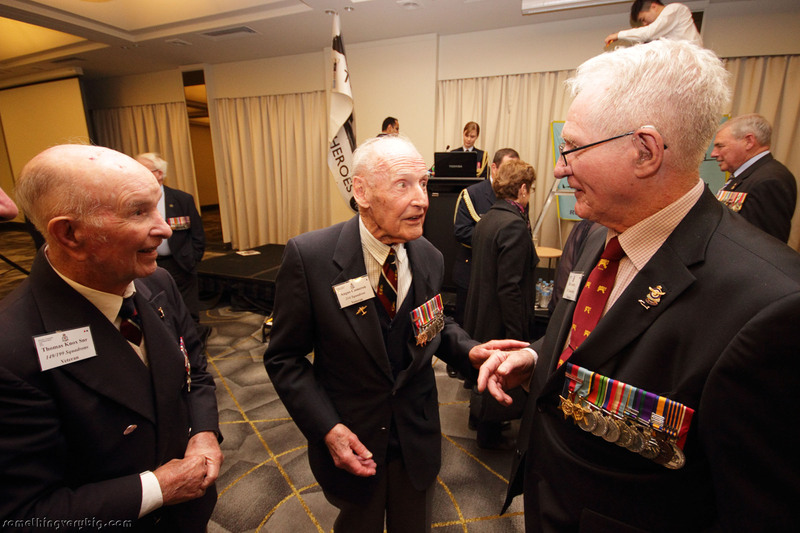 Tommy Knox, Angus Cameron and Rex Austin. Angus and Rex have just recognised each other for the first time in about 20 years. 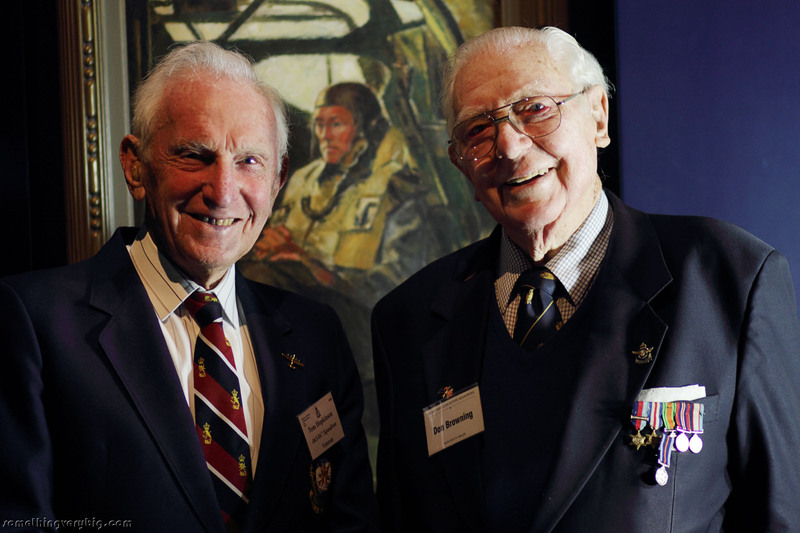 In the early 1950s, both rejoined the Air Force and were on the same ITS course together. The luncheon was beginning to wrap up and the crowd was thinning. 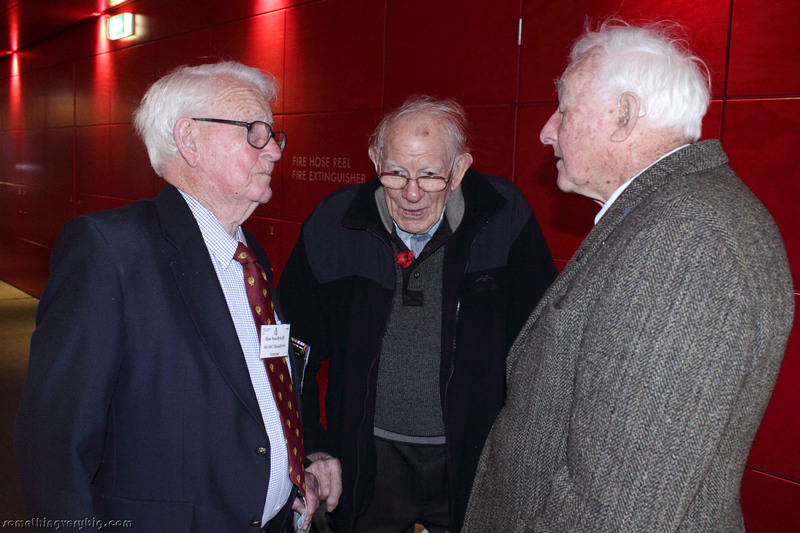 As I prepared to leave I saw two old blokes, the last people sitting at a table. 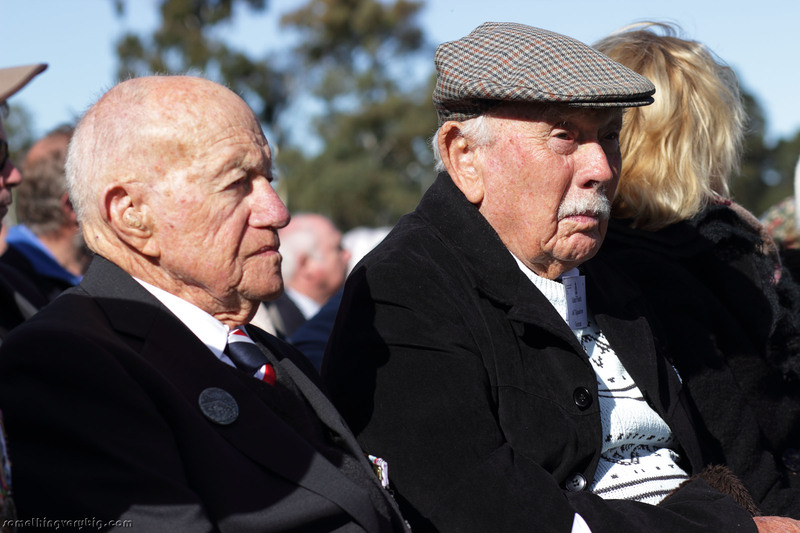 They were Angus Cameron and Tom Hopkinson, two Canberra-based veterans, and they looked very relaxed. 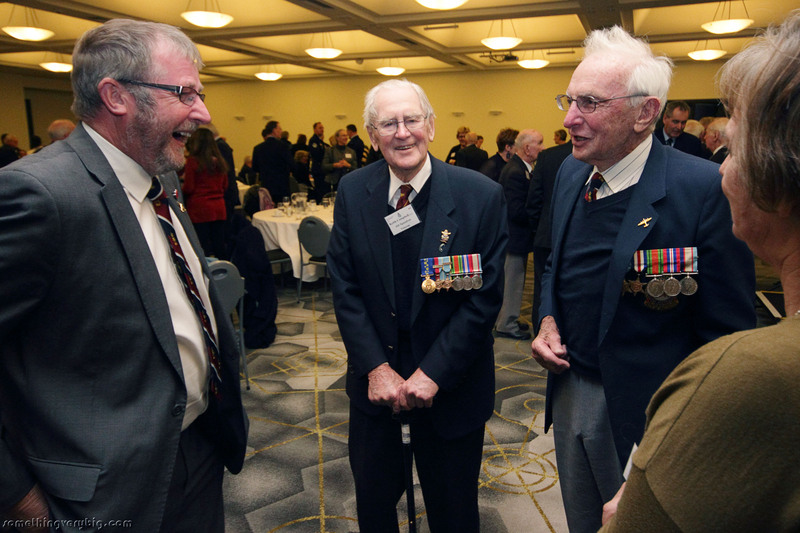 Two extraordinary, ordinary Australians, sitting back and having a lively chat. They were still at it as I left the room.